Support 128 items at max. Remove dependence on ObjectReference, should not cause CTD anymore in those rare cases, and records are generated only if necessary. and too lazy to use Creation kit, thus ditched it at last ? 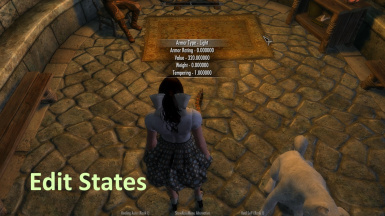 Or do you want to have your mod armors having the states of vanilla armors? Here is the mod for you. 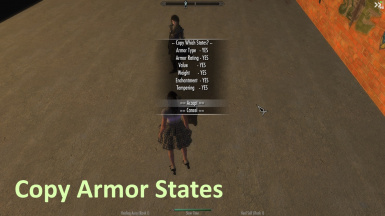 There was already a similar mod Transmogrification - Copy Armor Stats, but it can only keep the states of one set of armor, and is activated through mcm, thus doesn't suit my need. So I created this mod. And thanks to the mod, I did read the code of the said mod while writing this mod, was very helpful. - weapon will only copy to right hand one. Rename most objects, it wont create any record. 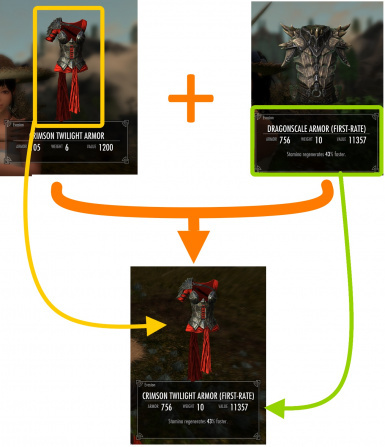 I have not found a way to get the corresponding forging and tempering formula given an item in-game yet, if you happen to know it, please PM me, thx. Most edits, except rename and enchantmentexcept rename and enchantments, will change all items of the same type. i.e. 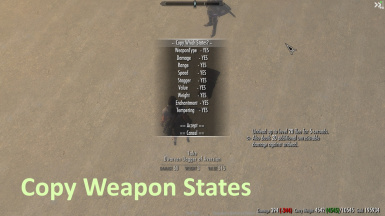 If you change the damage of a glass sword to 10000, all glass swords will have damage of 10000, so better only use this mod on mod items or unique items. This Mod support 128 items at max, you will get a notice in case you reach it. Before you remove a mod of a modified item, better remove the record through the provided menu first. 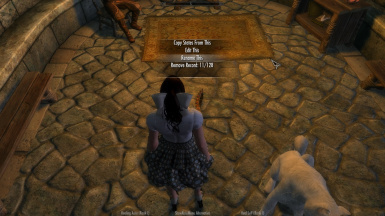 Did a few tests without records removed, didn't cause troubles AFAICT, but I am not 100% sure, don't whine if it causes CTD :P.
Most changes except rename and enchantments will stick until you relaunch skyrim, even if you load another save, should cause little troubles though.